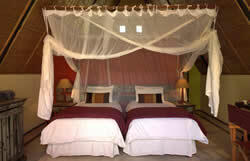 Pestana Bazaruto Lodge is a magical place! Just renovated, there are 26 thatched roof "A" frame Chalets stretched along a beautiful beach and sited amongst luxuriant tropical gardens. The island is a beautiful and unexplored destination, characterised by its wildlife, turquoise waters and idyllic beaches, all carefully protected as a Natural Reserve. 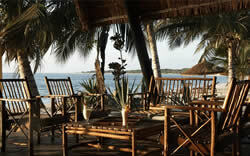 The Bazaruto Lodge hotel is situated in a bay on the north side of the island. This setting offers a unique combination of beauty, security and relaxation that makes it the perfect spot for lovers and nature lovers, as well as divers and sea sports enthusiasts, especially fishing. 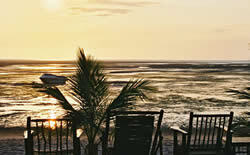 Bazaruto Island is the perfect paradise to forget the daily stresses of city life. 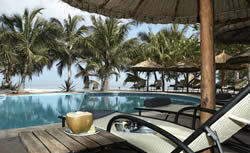 A blend of bright colours with African-style decoration gives you the perfect tropical island atmosphere. This Lodge with a special charm is the perfect antidote to stress. This is the only restaurant at the Lodge and dinner is announced every night by the sound of African drums. It is situated in the main building and has a capacity for approximately 80 persons. Mozambican and International food is served both À La Carte and as a Buffet. 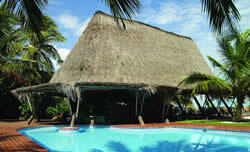 Our specialities are fish, seafood dishes and grills. 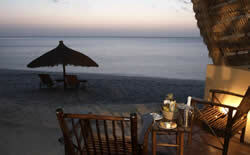 It is open daily for breakfast from 7h00 to 10h30, for lunch from 13h00 to 15h00 and for dinner 19h30 to 22h00. Open daily from 07:00 to 01:00, offering coffee, tea, international drinks, tropical cocktails and light meals. 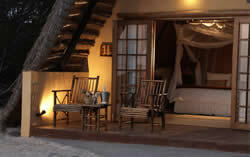 Please note that at Pestana Bazaruto Lodge full board is compulsory all year round.